Confidence among UK marketers remained high in the fourth quarter of 2013, according to the latest IPA Bellwether Report, with a net balance of 11 per cent of companies increasing their advertising budgets during the last three months of 2013. The study, which has served as a key indicator of industry health since 2000, calculates the net balance by subtracting the percentage reporting a downward revision from that registering an upward revision. The findings represent the fifth successive quarter of growth, at the second-highest rate, in the survey’s history (down slightly on the record of 12.3 per cent in the previous quarter) and suggest companies’ concerns about the economy are beginning to subside. Marketers also remain bullish about the financial prospects of their own companies (net balance of 47 per cent) and of the industry (net balance of 35.4 per cent) for the coming months. The sector with the greatest growth in budget was the internet, though the net balance of 9.2 per cent represented a three-quarter low. 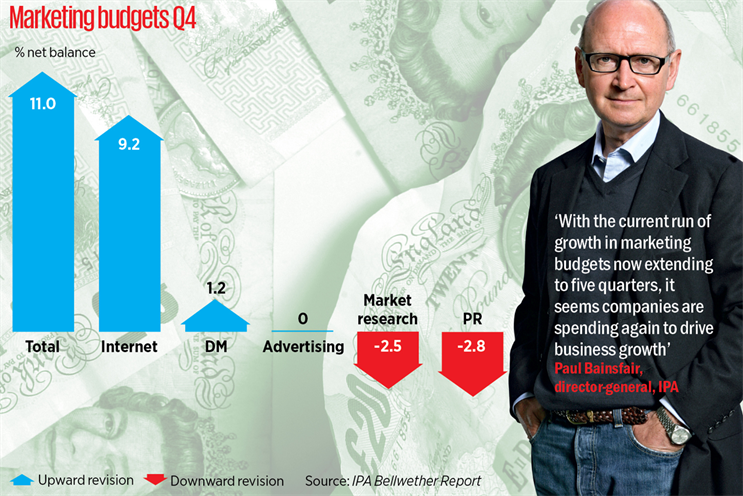 PR budgets suffered the greatest downward revision, with a net balance of -2.8 per cent. Provisional budgets suggest that marketing spend is set to rise in 2014. The Bellwether’s predictive model forecasts growth of 3.3 per cent in UK adspend this year. Chris Williamson, the chief economist at Markit and author of the Bellwether Report, said: "One of the most encouraging signals from the survey is the indication that companies are feeling more confident about investing in growing their businesses, advertising to build brands, supporting new product launches and taking the plunge in being more ag­gressive about boosting revenues.